According to an MSNBC article, Sarah Palin’s "favorability" is dropping a bit as she prepares to leave her position as governor of Alaska. A Washington Post-ABC poll showed that 53% of Americans view her negatively, while only 40% see her in a positive light, which is her lowest positive rating since she was first chosen to be John McCain’s running mate (and became a subject of polls such as this). Not surprisingly, Republicans still hold her in high regard… as many as 70% view her favorably and rank her among the top three contenders for a presidential candidacy in 2012. White evangelical protestants are her most avid supporters, but even their view of her hasn’t remained untarnished. Here’s a quote from the article summarizing the poll (emphasis mine). I had to pause when reading that because, as usual, I’m constantly amazed that anyone ever thought she did have an understanding of complex issues… or that they thought she did have leadership skills suitable for a vice presidency. In the 2008 election, I had been wavering between Obama and McCain. I was leaning toward McCain because he seemed like he was going to maintain fiscal conservatism without going all theological on the country the way Bush had done. I was leaning away from Obama because of typical "Democrat" things like union support, crazy spending, and bigger government. Then McCain picked Palin (or was directed to pick her… I don’t know) and after I learned about her and heard her speak, my decision was made. Palin was not (and still is not) vice presidential material, much less presidential material, and she repeatedly showed it every time she took the microphone or granted an interview. The media wasn’t hard on her. They tossed softballs. Katie Couric wasn’t even hard on her, but Palin came across looking like a uneducated bible thumper in nice clothes. She couldn’t answer simple questions. She got defensive when Couric pressed her for an answer to a reasonable question about what news sources she reads. She conveyed what I consider to be some reprehensible moral positions. I was disappointed because, even though I had (mostly) liked McCain, I couldn’t support him as president after making a choice like Palin for his vice president. So I was stuck with Obama, who I admired for some things, but who didn’t quite represent what I wanted. I liked (and still do) his international stance, his speaking ability, his education, some of his ideas… but I didn’t like some fiscal positions and union support. Palin was a deal-breaker because she was clearly unqualified on multiple fronts… yet Republicans and evangelicals just loved her to death. Maybe it’s just a religious thing… a carryover from Bush’s eight years of mobilizing and empowering the religious right to commandeer the Republican party. Maybe it all has to do with Palin making claims of God-inspired wars and praying that the country is following God’s plan. Maybe they liked her because, not only was she overtly religious, invoking God and faith on a regular basis, but she also winked at them and said, "You betcha!" It certainly can’t be her professional qualifications. I doubt if he was actually thinking that, but that joke and an interview question that my niece asked me yesterday for her school project started my speculation. Now that Barack Obama won the election and will be President of the United States of America come January, what will happen? I didn’t mean it as a negative against McCain. I don’t think any Presidential candidate can fulfill all the promises and plans made on the campaign trail. He may sincerely want to fulfill them, but when it comes right down to it, the President isn’t the “do’er.” He (or she) has influence (some more than others, obviously) and can help drive things in a certain direction, but it’s Congress who actually “does stuff” when it comes to domestic issues. The President can propose and he can shoot down. However, the “Commander in Chief” controls the military and controls foreign policy (more or less). I believe that Obama will represent the United States positively to the rest of the world and based on world polls, the world believes that, too. That, in and of itself, will do more for national security than any amount of border control or military action or aggressive posturing, especially in the long run. Representing the United States with strong, positive leadership tempered with humility and a willingness to listen to others’ viewpoints will repair this country’s relationships and make it stronger and safer. I believe Obama can do that. I’m not as sure about the heavily Democratic Congress, however, when it comes to domestic policy. I hope that Obama can bring any wildly left-wing proposals into the middle, but only time will tell. Up to this point, the gap between political parties has been fairly wide and the gap has gotten increasingly larger in the past 8 years, so hoping for a spontaneous “meet in the middle” would be somewhat naive. I do hope for a nudge in that direction, however… enough to get the ball rolling toward the middle area where it belongs. If Obama can get that to happen, I’d put a pretty big check mark in his “Success” column. I’m dismayed by the number of people who seem to think that being “folksy” is a good qualification for a presidential or vice-presidential candidate. Being able to connect with people is one thing. Using slang, bad grammar, and incorrect pronunciations for common words is something altogether different. Comedians and television writers get damned good mileage from it, but do we really want it from our public officials? Personally, I want someone smart in public office, especially in the office of President of the United States of America. When I say “smart,” I don’t just mean IQ. I mean having enough of an education to know how to speak in public, to use proper grammar, to pronounce common words correctly, to know enough about science to talk intelligently, to process information rationally, to negotiate effectively, to look at evidence objectively, and to know when to ask for help. There’s more to it than that, though. Someone “smart” understands that appearance matters… visually, audibly, and behaviorally. Folksy appears uneducated. It probably doesn’t appear that way to uneducated people, but to anyone else (who has an ounce of honesty)… it does. However, everyone looks favorably upon well-spoken, even folksy people. Well-spoken doesn’t mean using big words, literary flourishes, clever allusions, and mythological references. It means having the ability to get your point across cleanly and clearly, using proper grammar and a relatively solid grasp of the English language. That doesn’t offend or alienate anyone. That’s what I want in the office of President. We haven’t had it for 8 years now and, although McCain has it (or used to), his runner-up has precious little of it. Obama has it in abundance. Biden has it, too. When I visualize our president sitting down with other world leaders to discuss matters of global importance, I cringe to think of someone saying “new-cue-luhr” and “you betcha” and winking and stumbling over facts and simple scientific issues. If that happens, it reflects poorly on us as a country. It looks laughable. It looks farcical. It looks sad. I read a article today from The Washington Post’s E. J. Dionne Jr. about how Republicans are divided about the McCain/Palin ticket, which he attributes to a number of different causes. That aside, he also made the following statement. Conservatism has finally crashed on problems for which its doctrines offered no solutions (the economic crisis foremost among them, thus Bush’s apostasy) and on its refusal to acknowledge that the ‘real America’ is more diverse, pragmatic and culturally moderate than the place described in Palin’s speeches or imagined by the right-wing talk show hosts. I don’t know about conservatism having “finally crashed” but I do agree about its refusal to acknowledge that America is more “diverse, pragmatic and culturally moderate” than what the right-wing seems to believe (even leaving out the absurd conservative caricatures of Limbaugh, Coulter, and the like). I believe that moving too far from center on either side will have negative consequences. I don’t want Democrats controlling the Presidency and all of Congress any more than I want the Republicans controlling it all. There needs to be a balance… something that will force both sides to meet in the middle because, as we’ve seen before, if there’s nothing forcing them to do it, they won’t do it. 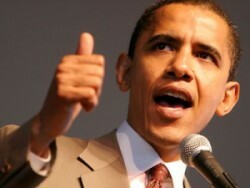 I really would like Obama to win the presidency. If that happens, what I would also like is for Republicans to control at least one of the houses of Congress. Having the Presidency, the Senate, and the House of Representatives all controlled by the same party, either Democrat or Republican, is a bad thing, in my opinion. We should never have another “rubber stamp” Congress the way we did for the first six years of Bush’s term (on either side of the fence) since it tends to nullify the system of checks and balances that the Constitution lays out. An even better solution would be to eliminate the party system altogether, but that’s not going to happen… and is perhaps a topic for another post. Joe Wurzelbacher, that is. He’s the “Joe the Plumber” of last night’s presidential debate fame. I’ve read about some of the interviews he’s given and I’m really impressed at the way he’s taking it. When asked about how he’ll be voting, he declined to say, but offered some words of wisdom. I’m not telling anybody anything [about voting]. It’s a private booth. I want the American people to vote for who they want to vote for. I just want them to be informed. He followed up with some words discounting his “celebrity” status. I’m a flash in the pan, not a megastar. I’m not Matt Damon. I’m not any of those guys who have droves of women and men who want to be them or will vote for them because Matt Damon said so. I love his movies but I don’t have that kind of power. Right now, I’m just completely flabbergasted by this whole thing and I’m sure if it happened to them they would be so, I just hope I’m not making too much of a fool of myself, and can get some kind of message out there, to watch actions and learn for yourself. Don’t take other peoples’ opinions. I mean, read it yourself. He really comes off like a guy with a good head on his shoulders… well-spoken, humble, and intelligent. We need more people like him. And no, Joe. You’re not making a fool of yourself. Cheers! I just watched a video on Fox News of a Sean Hannity interview with McCain and Palin. It had its share of the usual claims that you would expect from either party’s candidate during a campaign, so that was no surprise and was expected. Both McCain and Obama regularly make claims about the other that are misleading (and sometimes blatantly untrue). What really struck me in this interview, though, was McCain’s statement that Palin is “probably one of the foremost experts in this nation on energy issues.” He backed that up by saying that she was responsible for a 40 billion dollar pipeline bringing natural gas from Alaska and that she’s been on a board that oversees natural gas, oil, and other Alaskan resources. He says, “There’s nobody more qualified to take on our mission of becoming energy independence.” That’s not a typo. That was the quote. I was dumbfounded by the claim that Palin is one of the foremost experts in this nation on energy issues. …Because she was the governor of Alaska? I suppose if you consider “energy” to be only oil and natural gas, that claim might not be quite so outrageous, but it’s still pretty far out there. The 40 billion dollar pipeline claim is partially true, but misleading. She was partly responsible for moving the project closer to realization, but construction has not been started and the project isn’t a done deal yet. TransCanada, who is to be the builder, estimates that it will take 10 years to complete and will cost about 26.5 billion dollars, not 40 billion. Either way, claiming that, because she’s been governor of Alaska, Palin is one of the leading experts in the country on energy is like saying that I have foreign policy experience because I can see Russia from my back yard. My wife and I watched the entire debate last night and I felt a little bit disappointed. It was like watching a NASCAR race without a crash or a hockey game without a fight. 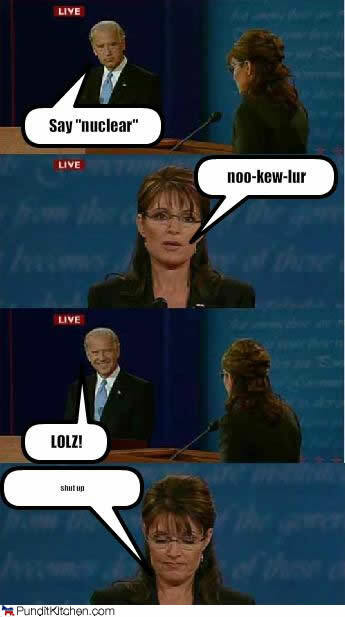 Biden kept his loquaciousness under control and Palin didn’t make any Couric-esque blunders.